Beginning Guitar I - The Very Beginning - Playing Your First Song! Lyle: One of the main things the beginning guitarist needs to be able to do is strum, count out loud, and tap their foot, all at the same time, so that they can play at a steady beat. It's easy for some, tough for others, but like all things, it get easier with practice. Lyle: Try this: Tap your foot on the ground and count 1, 2, 3, 4 each time you tap your foot. Repeat it over and over, keeping a steady beat. Lyle: There are many other ways to play the C chord, this is just the one-finger, three string way. The hard part about playing this simple C chord is getting the 1st and 3rd string to ring open, without getting muted or muffled by your index finger. 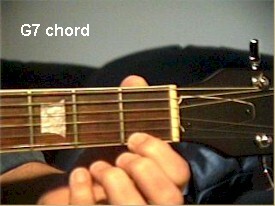 You will need to use the tip of your index finger to push straight down on the 1st fret, second string. Lyle: Many simple songs just use two or three chords. If we use the C chord as one of the chords, all we have to do is count up the alphabet to the 5th of C to get the second most important chord to use in a basic song. 5 up from C is G.
JJ: How many one finger chords (simple chords) are there? walkerjones: I thought F was the 5th of C? Lyle: C is 1, D is 2, E is 3, F is 4, G is 5, A is 6, B is 7, C is 1. Lyle: Take the TAB file and play it back using the loop button. You should hear a beat in the background audio of it. 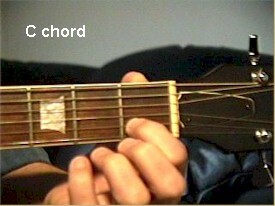 Strum the chord once, downward, on beat 1, count to 4, switch chords. Just like in the video example. You should work on counting out loud, strumming and tapping your foot, all at the same time. Lyle: You've got to be able to strum, count out loud, tap your foot, and follow the music, all at the same time. Like I said, it may be simple for some, but it's hard for others. Lyle: It is a little trickier now to do all the counting and tapping while the strumming part gets busier, but you should still work at it. Keep strumming all down. Lyle: Try this next rhythm riff. It has you strumming down for each of the 4 beats in the measure. Now your counting, tapping of your foot, and strumming are all going to be doing the same thing together. Lyle: Old, old folk songs can be very interesting. Most of them preceded blues and rock music. I read the words to this song Tom Dooley today and was shocked. Found them to be a little disturbing, just like some folks find Eminem lyrics disturbing. Lyle: Use all down strokes when playing this slow and simple melody. If you're a beginning student of mine, then you've just learned another song! Congrats to you! Try playing it to the looping jam track once you've memorized it. Joel: Yeah! For music fans: Tom Dooley was a Hit song for the Kingston Trio in the 50's 60's. :) A bit of a music nut. Lyle: There are hundreds, if not thousands of songs out there that are simple like this, and they're all fun to play. Lyle: I did not know that, Joel, thanks for the info! hutz13: Was Tom Dooley a real guy? Lyle: That wraps it up for this series of lessons. I hope I see you again at the next lesson. If you have questions, email me at Lyle@theguitar.net. Thanks!